Apparently the Italians call the double breasted, doppo. A much better name. I might use it myself. From Scabal's latest Autumn/Winter newsletter. Notice the ice blue shirts and navy repp ties. Hey guys, Desvaro from lowyat checking in here. Kenterong not sure if you remember me, I was with you and kotmj at ALT that time, I arrived late and by the time I got there you finished your fitting. 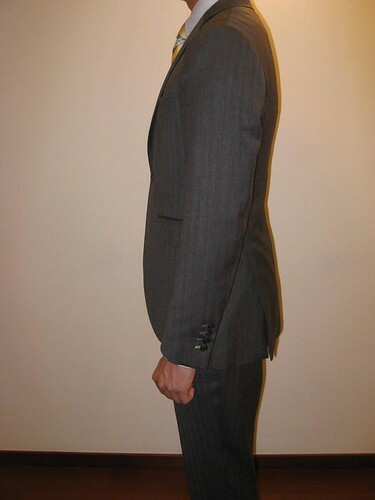 My suit turned out quite well (don't have proper fit pictures though), but it is very, very tight at the armpits. Once I start going to the gym again, I'm very sure I won't be able to wear it anymore. 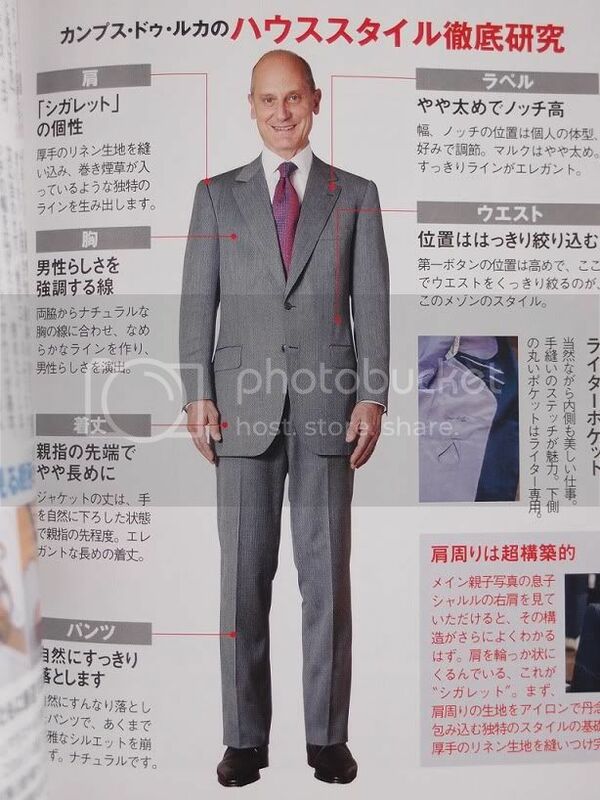 Bought a copy of Men's Ex, it features many tailors wearing their own creations. Some look like road kill in their own suits, but there are many instances of excellence. 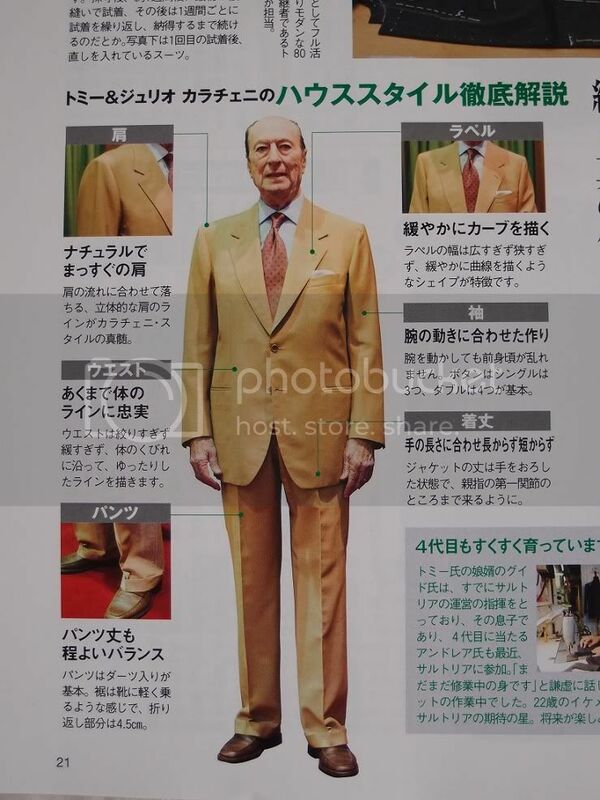 They have one section on European tailors, and another on 13 selected Japanese tailors. I see a jacket with the sort of chest drape that concentrates itself in fornt of the armsyce. I've seen a video of Marc checking a jacket, and their jackets sure are very stiff with a bulging chest that for some reason you don't really see in this particular instance. Quite a lot of waisting, moderately open front edge, very beautiful sleeves, straight shoulder with moderate roping. i have placed my order for 4.5m of the 8960.
hey, good to hear from you. i have to agree with kotmj: yours was a very good first fit. not at all surprised if the final result would fit well. 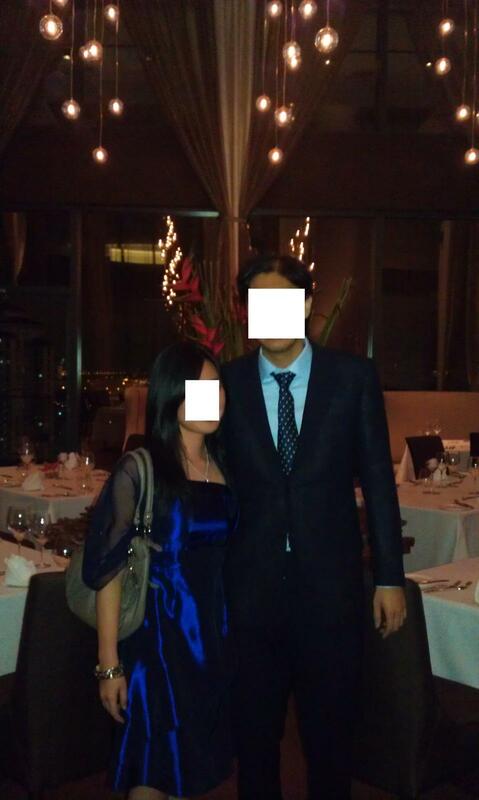 but it would be a shame if you can't wear such a well-fitting suit anymore after this (my wife made a similar comment when i told her i can't fit the suit i made with bespokened last year; about rm1.5k down the drain, even though it wasn't necessarily a good fit). please post fit pics if you can (while you still can! ), as a reference for the rest of us. Currently the best pictures I have of me in the suit. Same shirt in both pictures, just the lighting that makes it look different. Pray they don't send you the 8950 instead. Desvaro, it is possible to let out the jacket at the side seams -- I think an extra 3/4" in back width is possible. The more I look at this suit, the more I learn to appreciate its understated aesthetic. 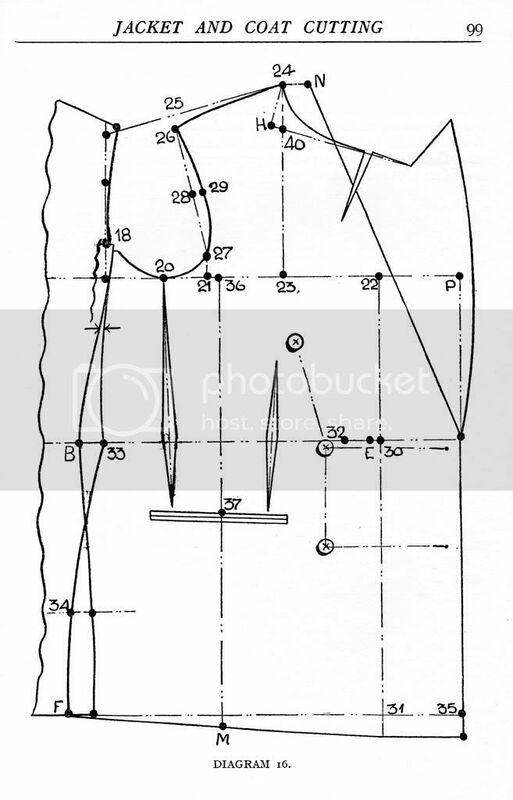 It appears to have been drafted to a pattern straight out of The Tailor and Cutter of the 1930s. I have always wanted to see how those old patterns made up. 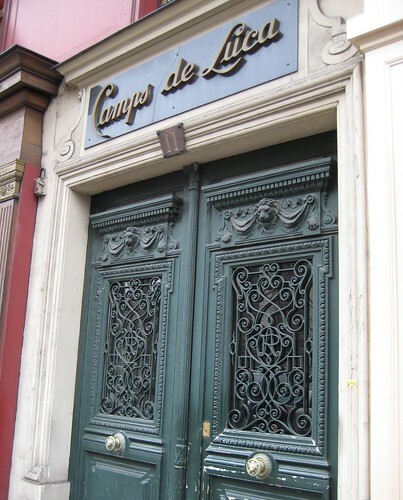 Looking at old garments do not give an accurate impression because old garments have been used and abused and no longer have their original ironwork. Besides, the original customer for which it was made is no longer with us and using a mannequin to model it is not the same. But here is an old pattern in a contemporary cloth, made recently, and modeled by the person it was made for. Though new, it looks vintage. The main contributors to the vintage look are the high degree of overlap and the mild waist suppression. The peaked lapels, too, are styled the old way, being more horizontal than vertical. I like the subtility of the jacket and the complete lack of exaggeration. 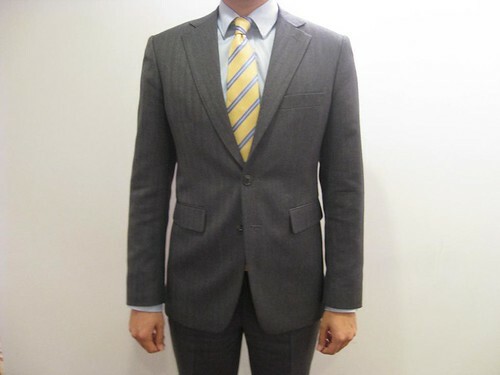 A two piece suit costs only RM 16,000, what a steal. the 8950 does look rather interesting but probably not very suitable for business occasions. my relative has confirmed receipt of the grey cloth. hopefully it is the right one sent. Kenterong, when is the relative coming over? 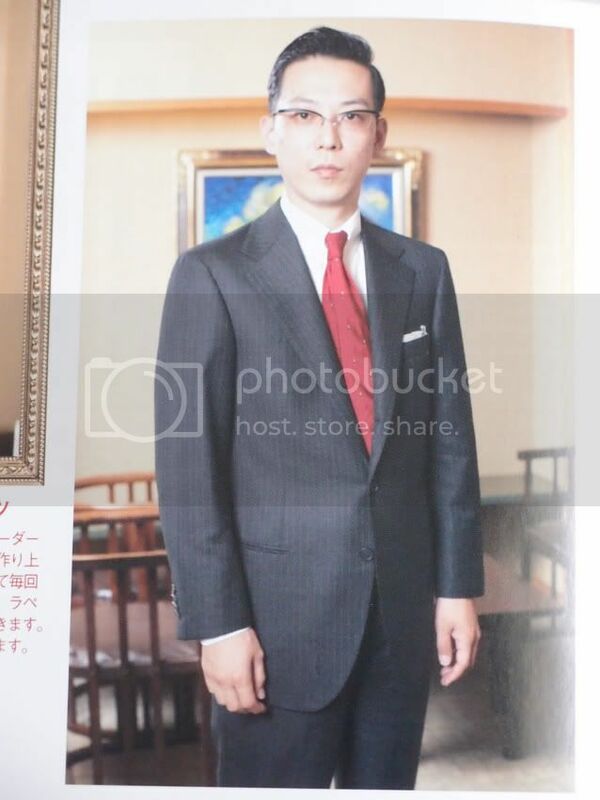 This is the second featured tailor in the Japanese category. It looks like a funeral pic one affixes to the front of the hearse, with the guy already decomposing in the coffin. It is a big roomy coat with minimal waist suppression and sleeves so roomy you can hide a chicken or two in them. Buttoning point is low, lapels are wide, front edge open, minimal roping on sleevehead. I'm calling this The Poultry Farmer silhouette. The next fit pic will be much better. he will be back in kl this monday. i suppose i will need to pick it up before the coming saturday? That would be ideal. The best time to make a suit is when you don't need it. Commissioned a 3 piece from D&J; this is my second suit with them. Fabric is a 12oz grey herringbone, rather heavy and probably sweat inducing during summer time. Didn't wear the vest as I didn't want to stand out in office (maybe when I get a little older or after the next promotion ). Pardon the creases in the pants, a result of sitting through the day. 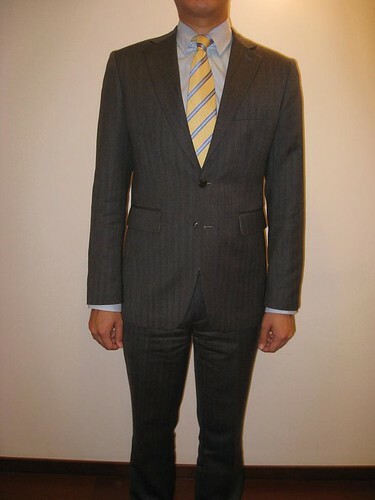 A nice suit, miles better than anything you can get here. The trousers are fabulous. 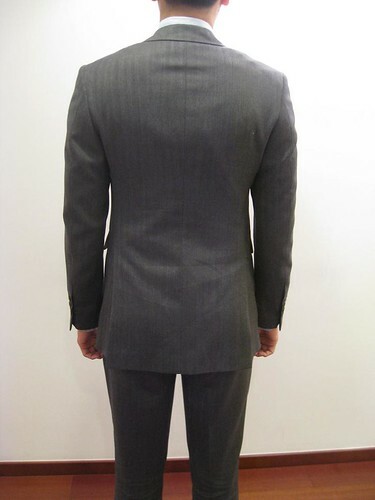 There is, however, one rather unusual feature: The hip pockets are positioned very high up! Is that a Shanghainese feature? May I ask what brand of cloth is that and from which bunch? I have many pairs of trousers in many kinds of cloth, never seen such wrinkling. 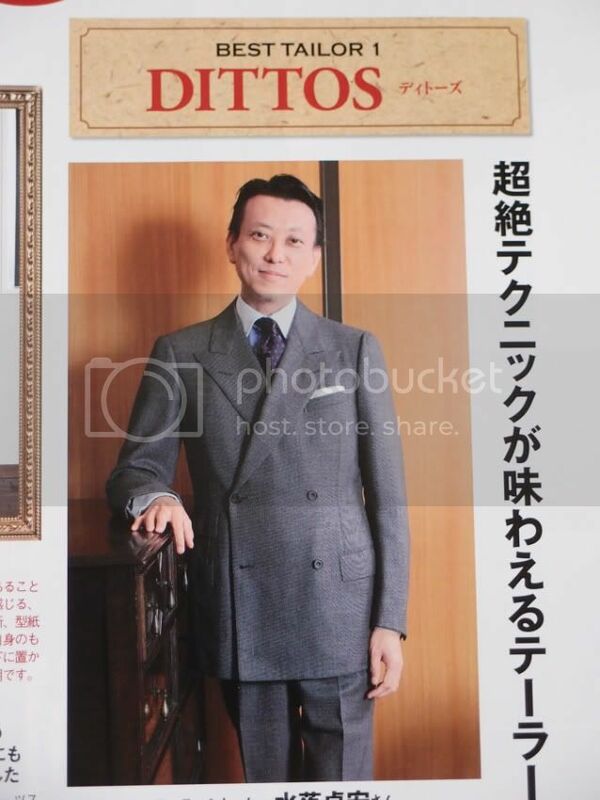 that is a very2 nice suit deriku!if you like 11 or 12oz fabrics, the Minnis Crown Classic is being discontinued and sold for 20 pounds a meter only! kotmj, not that I have anything against the good people of Shanghai, but any features you see on the suit would be more of a Beijingese feature I did notice the high position of the pockets but the tailor told me it was too late to change. I would have preferred them to be at the same level or slightly lower than the 2nd button position. I also requested for slanting pockets but the tailor missed that too. Should have asked for a discount eh.. The fabric is unbranded worsted from British Fabrics, got it for about 70 quid. Found the Minnis site. The blues are mostly sold out, too bad since I was looking to get some fabric in that color. How much do they charge for shipping? Thoughts on the fabrics below? Shipping and insurance to Malaysia will set you back around 40 pounds.so that basically wipes out any savings you get on the VAT.I was tempted to order but the fact that it's 12oz, that would mean suicide if I were to wear it in Malaysia.I am more inclined to go with the 2308 and 2347 though since your looking for blue,the 2347 navy would suit you better deriku.